The death penalty, the most severe sanction or punishment a government entity can impose on an individual for a crime, has existed in some form throughout recorded history. The first known official codification of the death penalty was in eighteenth century B.C.E. in the Code of King Hammurabi of Babylon, where twenty-five crimes could result in the ultimate sanction by the state. From then until the twenty-first century the variants of capital punishment throughout the world have included crucifixion, drowning, beating to death, stoning, burning alive, impalement, hanging, firing squads, electrocution, and lethal injection. 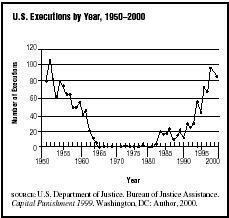 The death penalty has been abolished in Western Europe and Japan, but its persistence in the United States has incited heated debate over its efficacy and inherent justness. The major rationalizations for capital punishment are retribution, deterrence, incapacitation, and rehabilitation. Obviously, the last bears no relation to the death penalty. Retribution, which argues that the state has the right to impose a level of pain and punishment equal to or greater than the pain suffered by the victim, seeks to justify the death penalty on principle rather than efficacy in reducing crime. The notion of deterrence does make this claim imply a utilitarian purpose. There are two forms of deterrence: general and specific. The latter focuses on the individual offender, who, it is claimed, is deterred from committing future crimes by punishing him/her for previous criminal activity. The former seeks to prevent such crimes from occurring in the first place. In the case of the death penalty, the well-publicized knowledge that the state punishes some crimes by death presumably deters potential criminals. Many criminologists argue that the goal of incapacitation—removing an offender from society—can be achieved equally effectively through a life sentence without the possibility of parole (LWOP). The results of the more than 200 studies done on capital punishment are either inconclusive or adverse to the claim that it is an effective deterrent to murder. The typical research design compares murder rates in state that have and use the death penalty with (1) those that either have not used it, although the law permits its use and (2) states that have abolished it. In general, these studies tend to show no difference in homicide rates for comparable states that with and without capital punishment. Nor is there evidence that homicide rates decline or increase as states decide to reinstate or abolish the death penalty. Why has the death penalty been an ineffective deterrent in the United States? First, capital punishment is applied with neither certainty nor swiftness, the two key characteristics of an effective deterrent. When the death penalty is imposed, it often takes many years for the sentence to be carried out, and in some cases the sentence is not upheld. In the United States in 1999, 271 prisoners were admitted to death row, while more than 15,000 murders were reported to police. In the same year, 88 persons had their sentences overturned. The idea of deterrence presupposes rationality and premeditation on the part of the murderer. In most murders, such factors take a backseat to nonrational influences such as rage, alcohol or drug abuse, or psychological disorder, none of which are susceptible of deterrence by death sentence. For these reasons, the most persistent and persuasive arguments for the death penalty rely on notions of just retribution and revenge by the state on behalf of the citizenry. Opponents of the death penalty point not only to its lack of deterrent effect but also raise other key arguments. First, from a moral perspective, the abolitionists believe state executions signal that violence is an acceptable means of resolving conflicts and thus actually contribute to a climate of increased violence. Second, opponents point to the unfair and discriminatory application of the death penalty, noting the disproportionate numbers of poor people and people of color on death row, many of them having lacked vigorous and effective legal counsel. Moreover, advances in DNA analysis have exonerated enough prisoners on death row to give pause to many lawmakers who point to the ever-present possibility that the state might, for lack of adequate probative or exculpatory evidence, take the life of an innocent person. This concern has led to several U.S. states to implement a moratorium on the death penalty until it can be shown to be applied fairly to all such cases. Comprehensive data on the use of the death penalty for all countries is difficult to collect and verify. Most of the data presented here come from two organizations opposed to capital punishment: Amnesty International and the Death Penalty Information Center. Yet the trend is clear; more and more countries are either abolishing or placing further restrictions and limitations on capital punishment. 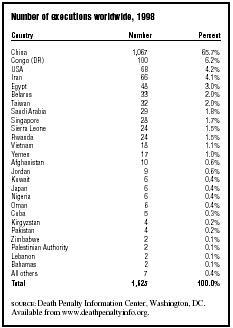 As of 2001, 108 countries have abolished the death penalty in law or in practice, up from 62 in 1980. Of that 108, 75 have abolished it for all crimes while another thirteen have done so for "ordinary crimes." Another 20 have the authority to carry out this sanction but have not done so. Of those that have retained its use, the death penalty is used with regularity in the Islamic nations, in most of Asia, many parts of Africa, and the United States. The United States, Kyrgyzstan (the former Soviet republic), and Japan are believed to be the only other countries where the mentally retarded are put to death. SOURCE: Death Penalty Information Center, Washington, DC. five countries accounted for more than 80 percent of all executions. The use of executions in China is even greater than these numbers would suggest. According to Amnesty International, from 1990 to 2000, China has executed 19,446 people, which compares to the 563 the United States put to death over the same period. In 1996 alone, more than 4,000 persons were put to death by China as part of its "strike hard" campaign against crime. This policy results in mass application of the death penalty for persons convicted of both crimes of violence and property crimes. For example, on June 30, 2001, four tax cheats were executed for bilking the government out of nearly $10 million in tax rebates. emerged beginning in the late 1980s. For example, from 1987 to 1992, East Germany, Czechoslovakia, Hungary, and Romania eradicated the death penalty, and all twelve of the Central European nations that retained the death penalty during the Soviet era have since abolished it. The Ukraine abolished its death penalty in 2000, and Russia suspended executions in mid-1999. The death penalty has been a controversial part of the U.S. social and legal orders since the country's founding in the late eighteenth century. Initially persons were regularly put to death by the state for a wide array of criminal acts that included murder, witchcraft, and even adultery. And up until the 1830s, most executions were held in public. Public executions continued until 1936, when 20,000 citizens observed a public execution in Owensboro, Kentucky. SOURCE: Death Penalty Information Center, Washington, DC. Available from www.deathpenaltyinfo.org; Zimring, Franklin E., and Gordon Hawkins. Capital Punishment and the American Agenda . Cambridge: Cambridge University Press, 1986.
in 1976— Gregg v. Georgia, Proffit v. Florida, and Jurek v. Texas —allowed the resumption of capital punishment. As shown in Figure 1, executions resumed shortly thereafter. By the late 1990s the totals were close to those of the early 1950s. In 2001 there were approximately 3,500 prisoners under the sentence of death in the United States. Of this number, 55 percent were white and 43 percent were black. All have been convicted of murder; 2 percent received the death sentence as juveniles. Fifty women were on death row as of 2001. Fifteen states, along with the federal government, ban the execution of prisoners who are mentally retarded, but twenty-three do not. The most common form of execution is now lethal injection, which is used in thirty-four states. Although the federal courts have played a significant role in death penalty reforms, it is also true that until the 2001 execution of Timothy McVeigh, death sentences and executions since Gregg v. Georgia have been solely carried out by state courts. Moreover, there is considerable variation among the states in the use of the death penalty that seems to have little to do with crime rates. As of 2000, thirty-eight states had death penalty statutes, although only twenty-nine actually executed prisoners; of those, only a handful account for most of the executions. According to the Bureau of Justice Statistics, as of 1999, there had been 4,457 persons executed since 1930. States that have conducted the most frequent number tend to be southern states, led by Texas (496) and Georgia (389). Conversely, Michigan was the first state to abolish the death penalty for all crimes except treason, more than a century before France and England enacted such a reform. Seven states that provide a death sentence in their statutes have not conducted any executions for more than twenty-five years. South Dakota and New Hampshire have not had executions in more than half a century. New Jersey legislated a death penalty statute in 1980 but has not applied it thus far. As shown in Table 2, the southern states have consistently and increasingly accounted for the vast majority of U.S. executions since the 1950s. In 2000 seventy-six of the eighty-five U.S. executions were in the South, even though that region accounts for about one-third of the population and about 40 percent of the American states that authorize a death penalty. Two-thirds of all American executions in 2000 were conducted in three of the thirty-eight states that authorize executions (Texas, Oklahoma, and Virginia). A major topic revolving around the death penalty is the extent of racial and class bias in its implementation. As noted above, only very few persons convicted of murder actually receive the death penalty. This raises the important question of how decisions are reached by prosecutors to pursue punishment by death penalty. According to a recent U.S. Department of Justice study, in nearly 80 percent of the cases in which the prosecutor sought the death penalty, the defendant was a member of a minority group, and nearly 40 percent of the death penalty cases originate in nine of the states. Another study found that the race of the victim and the race of the offender were associated with death penalty sentences. Baldus, David, Charles Pulaski, and George Woodworth. "Comparative Review of Death Sentences: An Empirical Study of the Georgia Experience." Journal of Criminal Law and Criminology 74 (1983):661–685. Bohm, Robert M. "Capital Punishment in Two Judicial Circuits in Georgia." Law and Human Behavior 18 (1994):335. Clear, Todd R., and George F. Cole. American Corrections, 5th edition. Palo Alto, CA: Wadsworth, 2000. U.S. Department of Justice. Bureau of Justice Assistance. Capital Punishment 1999. Washington, DC: U.S. Government Printing Office, 2000. U.S. Department of Justice. Federal Bureau of Investigation. Uniform Crime Reports, 1999. Washington, DC: U.S. Department of Justice, 2000.